Early Investors are making 50,000% returns on ICOs – PipPhenes Inc. The average return on the S&P is 10%. Over the last year bitcoin has seen unprecedented returns of 1000%. But savvy cryptocurrency investors are investing in ICOs and making ROIs as high as 50,000%. Stop and think about that for a moment. That means for a $100 investment in early 2017 you could have netted $50,000. Not too shabby for a year of trading. ICOs (Initial Coin Offerings) are a relatively recent phenomenon where investors exchange cryptocurrency (usually Ethereum) for a stake in an early stage project. This sort of early stage investing has traditionally been highly regulated. Cryptocurrency has provided a way around these regulations. Rather than having to wait to invest until companies grow large enough to IPO and hit the stock market, ICOs let you get in at the ground floor. Not every market is thrilled with ICOs thumbing their noses at regulation. China and South Korea both banned ICOs earlier this year and the United States is beginning to crack down on ICOs that violate security laws. Despite this, many investors are optimistic about the early stage investing opportunities that ICOs provide. Imagine if you could get in on Facebook when it started back in 2004. Or Google just as it was raising its early rounds? ICOs make this a reality. Why it matters: Komodo is yet another platform for creating applications on the blockchain. The twist is it’s focus on ICOs. It allows anyone to seamlessly create their own blockchain, issue tokens, and ICO. It’s built off a zcash fork so unlike ethereum it offers anonymous usage and transactions. One-liner: Lets blockchains communicate with other blockchains. Why it matters: There are many cases for businesses to create and maintain their own blockchain. Ark aims to allow easy communication between different blockchains. Rather than having a bunch of independent data stores and platforms with Ark there is the potential for a network. The need for this network will likely increase as more and more blockchains are created. Why it matters: Privacy focussed cryptocurrencies like Monero and Zcash have been getting a lot of attention lately. Spectrecoins claim to fame is that it provides network privacy by running within the TOR network. The top ICOs of 2017 offer thousand % returns on investment - but what about the average return? Are ICO returns simply a matter of luck? At a rate of 1,320% ROI, ICOs beat out even bitcoin’s prodigious rise over the last year. Unfortunately as ICOs gain popularity as a fundraising mechanism more and more projects seek to take advantage of them. In November, cryptocurrency startup ‘Confido’ raised $375,000 in an ICO before disappearing without a trace. Others like Tezos, which raised 232 million earlier this year, are embroiled in multiple lawsuits with investors demanding their money back. The lack of regulation in this space has lead to a wild west where anything can happen. Investors should be prepared to do their research and approach all potential investments with skepticism. 2017 has been a watershed year for cryptocurrency. But the trend is just getting started. The number of ICOs is increasing at an exponential rate. According to Smith & Crown, there are 190 ICOs planned for next month and more are listed every day. This is a massive increase from the handful of ICOs that launched in 2016. * Totals raised are based on data from Smith and Crown and reported by companies. Despite a brief dip in July and August, ICO investment has recovered and shows signs of increasing exponentially. Right now investing in ICOs has a moderately high barrier to entry. You must hold ethereum, which many investors are only just learning about. You have to learn how to interpret white papers and must be technical enough to understand how your EC20 tokens will be stored. If you want to trade on an early exchange like Etherdelta, be prepared to learn how to use metamask and manually manage your own ethereum transactions. We will likely see more interest and activity in this space as these barriers to entry are broken down in the following year. most widely accepted crytocurrency when it comes to ICO investing. It’s also the currency of choice for trading for ICO tokens once they hit an exchange. Unlike IPOs which require rigorous screening, there is very little regulatory work required for a company to ICO. At the very least you should look into who the founders are, how much traction they have, and what sort of token they are offering. Some ICOs are targeting investors with Google ads or awarding bonus tokens for investing within a limited time window. There is nothing wrong with good marketing tactics (they can indicate a good team) but recognize when they are being used against you. 3. Only invest what you can afford to lose. income and they should be a small part of your overall investment strategy. Billionaire investor Mark Cuban recommends investing no more than 10% in bitcoin. Treat ICOs with even more caution. The majority of startups fail, even well funded ones, so be prepared to lose what you invest, even if the landscape is optimistic. “We are likely going to have another couple of attempts next week as the bulls aren’t ready to give up the chase just yet. We are continuing to watch the risk carefully and have been working on repositioning portfolios over the last couple of weeks. 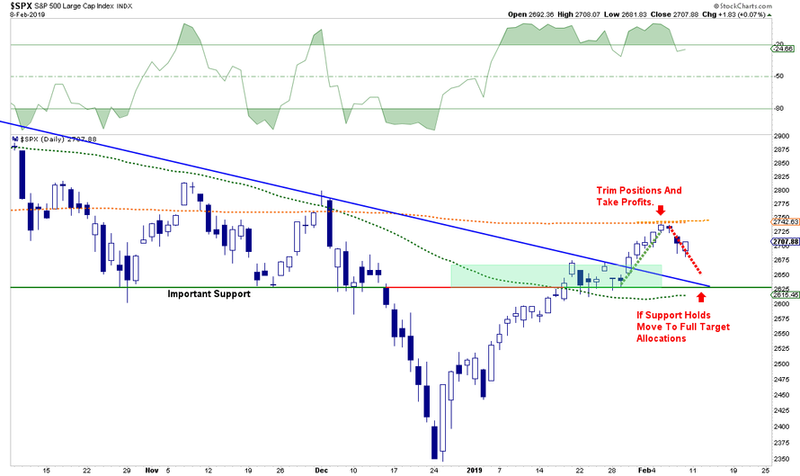 On Monday, the markets rallied a bit out of the gate over continuing hopes of a “trade deal” between the U.S. and China but fell back to even by the end of the day. 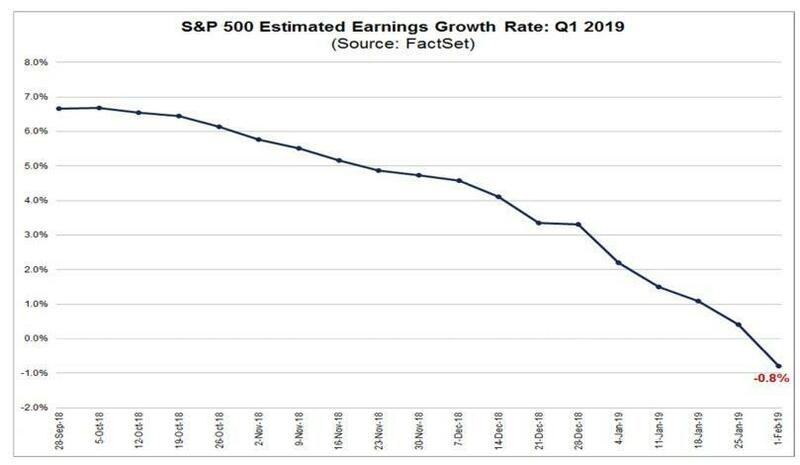 With earnings season now largely behind us, the “bulls” are going to need improving economic data and relief from Washington to provide continued support for the rally. This morning, futures are once again pointing higher on news that a proposal is ready to be sent to the President providing just $1.4 billion for border “security,” no wall, to avert another Government shut down. It is highly likely the bill will be rejected by the President and he will start talking about the use of a “national security” issue to fund the building of the wall. This will divide Congress even more than it is already almost ensuring NO legislation passes before the end of the President’s first term. Also, talks are once again starting with China over trade. This is also buoying markets in the short-term in hopes of a resolution to reduce the impact of tariffs on businesses. Hopes for a noteworthy “deal” remain extremely slim at this point. But those two issues are actually relatively minor as other issues, as noted on Saturday, will actually bear much more weight on the market going forward. Of course, despite those more macro-concerns, the market has had a phenomenal run from the “Christmas Eve”lows and has moved above both the Oct-Nov lows and the 50-dma. This is clearly bullish in the short-term for investors. With those levels of previous resistance now turned support, there is a little cushion for the bulls to hold on to. The biggest hurdle for a bullish advance from current levels is the cluster of resistance sitting just overhead. Sven Heinrich noted the market remains stuck below the collision of the 200-day, the 50-week, and the 15-month moving averages. As shown, this set up previously existed back in late 2015 and early 2016. The initial challenge saw the market actually break back above the cluster of resistance, which “sucked the bulls” back into the market before setting new lows. Note that during the recent sell-off, the move to bearish funds never achieved the levels seen during the 2015-2016 correction. More importantly, the snap-back to “complacency” has been quite astonishing. The next chart puts it into a longer-term perspective for comparison. But stepping back to the long-term trends, when managing money the most important part of the battle is getting the overall “trend” right. “Buy and hold” strategies work fine in rising price trends, and “not so much” during declines. 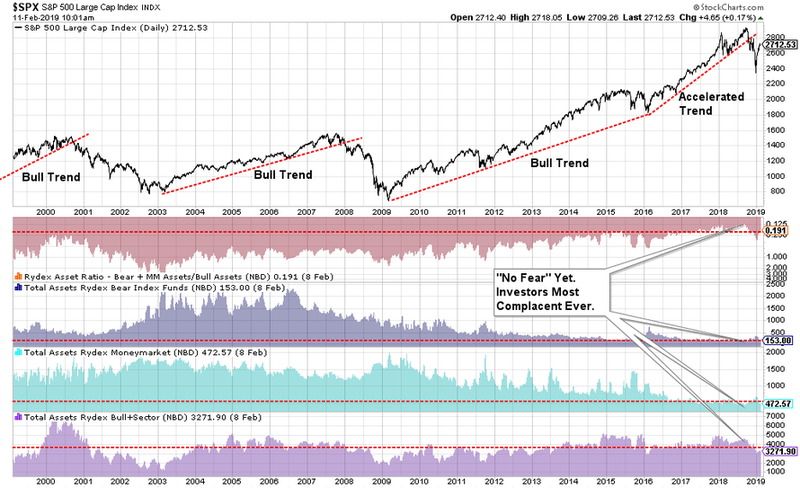 Since the primary messaging from the media is that “you can’t miss out” on a “bull market,” investors tend to dismiss the basic warning signs that markets issue. However, because “bear markets” happen fast, by the time one is realized, it is often too late to do anything about it. So, you just have to ride it out. You don’t have any other option. Right? The chart below is one of my favorites. 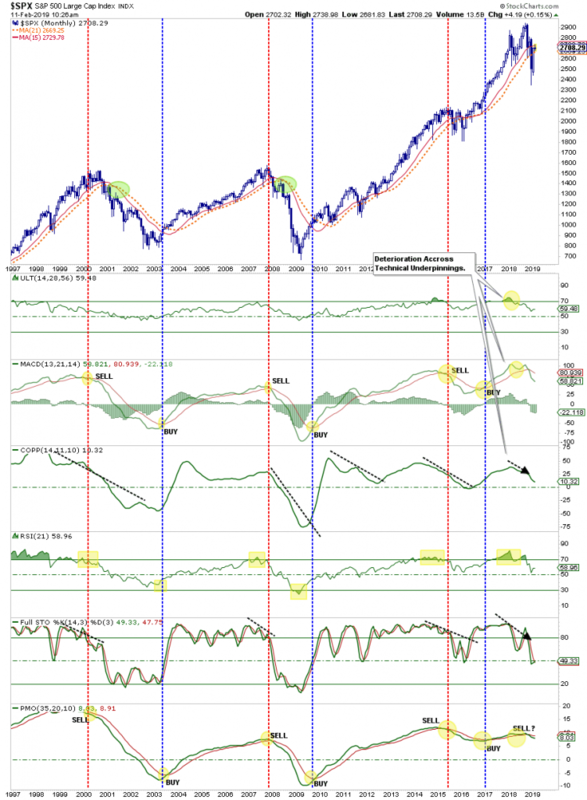 It is a monthly chart of several combined indicators which are excellent at denoting changes to overall market trends. 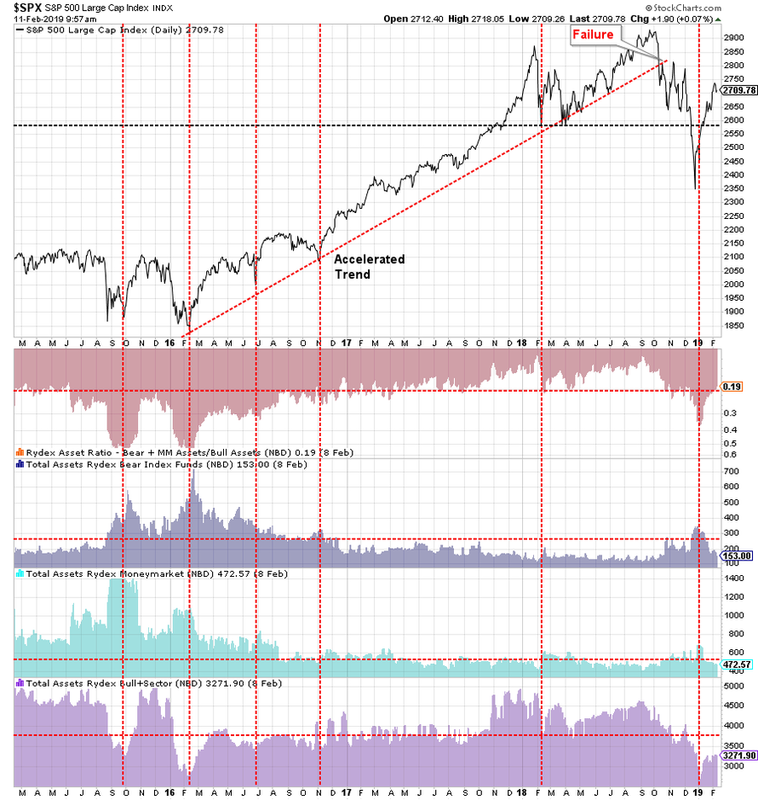 The indicators started ringing alarm bells in early 2018 which is when I begin talking about the end of the “bull market” advance. Currently, every single monthly indicator, as of the end of January, is currently suggesting downward pressure on the market. 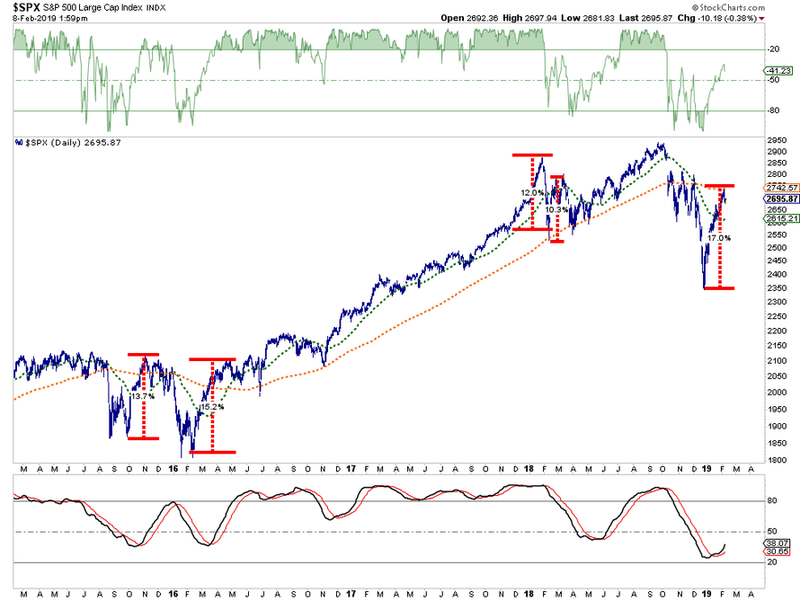 The only signal which has yet to confirm is the cross of the 15-month and 21-month moving averages. The 21-month moving average has pretty much been both support and/or resistance, to the overall trend of the market for the past 25-years. At present, the market is “trapped in the middle” between those two monthly averages. 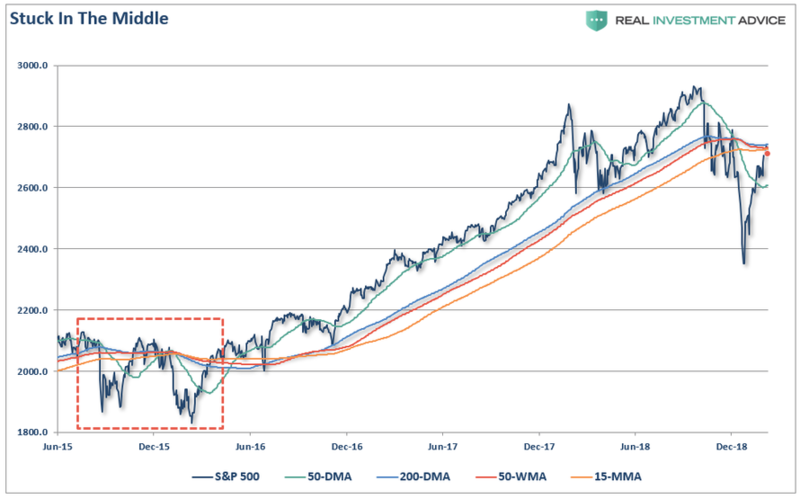 If the bull market is going to resume, the market needs to break above the 15-month moving average and rally enough to reverse the torrent of sell-signals running across the complex of price indications. With earnings and economic growth weakening, this could be a tough order to fill in the near term. What are some things that separate a good trader from a great one? Guts, instincts, intelligence and, most importantly, timing. Just as there are many types of traders, there is an equal number of different time frames that assist traders in developing their ideas and executing their strategies. At the same time, timing also helps market warriors take several things that are outside of a trader's control into account. Some of these items include position leveraging, nuances of different currency pairs, and the effects of scheduled and unscheduled news releases in the market. As a result, timing is always a major consideration when participating in the foreign exchange world, and is a crucial factor that is almost always ignored by novice traders. Want to bring your trading skills to the next level? Read on to learn more about time frames and how to use them to your advantage. In the grander scheme of things, there are plenty of names and designations that traders go by. But when taking time into consideration, traders and strategies tend to fall into three broader and more common categories: day trader, swing trader and position trader. Let's begin with what seems to be the most appealing of the three designations, the day trader. A day trader will, for a lack of a better definition, trade for the day. These are market participants that will usually avoid holding anything after the session close and will trade in a high-volume fashion. Usually the longest time frame of the three, the position trader differs mainly in his or her perspective of the market. Instead of monitoring short-term market movements like the day and swing style, these traders tend to look at a longer term plan. Position strategies span days, weeks, months or even years. As a result, traders will look at technical formations but will more than likely adhere strictly to longer term fundamental models and opportunities. These FX portfolio managers will analyze and consider economic models, governmental decisions and interest rates to make trading decisions. The wide array of considerations will place the position trade in any of the major currencies that are considered liquid. This includes many of the G7 currencies as well as the emerging market favorites. With three different categories of traders, there are also several different factors within these categories that contribute to success. Just knowing the time frame isn't enough. Every trader needs to understand some basic considerations that affect traders on an individual level. In addition to leverage, currency pair volatility should also be considered. It's one thing to know how much you may potentially lose per trade, but it's just as important to know how fast your trade can lose. As a result, different time frames will call for different currency pairs. Knowing that the British pound/Japanese yen currency cross sometimes fluctuates 100 pips in an hour may be a great challenge for day traders, but it may not make sense for the swing trader who is trying to take advantage of a change in market direction. For this reason alone, swing traders will want to follow more widely recognized G7 major pairs as they tend to be more liquid than emerging market and cross currencies. For example, the euro/U.S. dollar is preferred over the Australian dollar/Japanese yen for this reason. Which Time Frame Is Right? Which time frame is right really depends on the trader. Do you thrive in volatile currency pairs? Or do you have other commitments and prefer the sheltered, long-term profitability of a position trade? Fortunately, you don't have to be pigeon-holed into one category. Let's take a look at how different time frames can be combined to produce a profitable market position. As a position trader, the first thing to analyze is the economy - in this case, in the U.K. Let's assume that given global conditions, the U.K.'s economy will continue to show weakness in line with other countries. Manufacturing is on the downtrend with industrial production as consumer sentiment and spending continue to tick lower. Worsening the situation has been the fact that policymakers continue to use benchmark interest rates to boost liquidity and consumption, which causes the currency to sell off because lower interest rates mean cheaper money. Technically, the longer term picture also looks distressing against the U.S. dollar. Figure 5 shows two death crosses in our oscillators, combined with significant resistance that has already been tested and failed to offer a bearish signal. Although too easy to believe, this process is widely overlooked for more complex strategies. Traders tend to analyze the longer term picture without assessing their risk when entering into the market, thus taking on more losses than they should. Bringing the action to the short-term charts helps us to see not only what is happening, but also to minimize longer and unnecessary drawdowns. Time frames are extremely important to any trader. Whether you're a day, swing, or even position trader, time frames are always a critical consideration in an individual's strategy and its implementation. Given its considerations and precautions, the knowledge of time in trading and execution can help every novice trader head toward greatness. You must have been on that SpaceX rocket of Elon Musk to Mars if by now you haven’t heard about the new regulatory framework for Forex and CFD brokers. Just in case you don’t know yet, on Tuesday the European Securities and Markets Authority (ESMA) published its verdict on the conduct of brokers in the industry. Unfortunately, as it many times happens, the mistakes of the few have impacted the many (or perhaps the other way around in this case, not so sure on this one). Unregulated brokers that have plagued the Forex and CFD trading industry, along with binary options brokers have prompted a drastic response on behalf of the supranational EU-wide industry watchdog. Again… I am assuming you are not from Mars, but just in case Elon did manage to insert you inside the spaceman suit on that roadster, here are the changes to regulations in brief. Maximum leverage for trading FX has been cut to 1:30, indices and gold are at 1:20, other commodities are at 1:10 and shares are at 1:5. We are going to have a look at the impact on the industry from two different perspectives. The first one is that of brokers that are acting as principals and are internalizing their flow. The so-called ‘market makers’ are likely to get more materially affected by the changes mandated by the ESMA. The reason for that is that such brokers are typically more reliant on direct marketing, trading incentives, and most crucially, their clients losing money. Higher leverage always means a shorter life-span for a retail trader’s account. Low levels of leverage are the preferred way to trade for institutional investors, where big drawdowns in the account balance are quite unwelcome. Brokers have been offering high leverage to clients in order to lure them into the narrative that it is easy to make a lot of money with a relatively small deposit. The reality in the financial markets however, is that, as described by the ESMA, between 80 and 95 percent of retail clients are losing their deposits. So when a market-making broker attracts a client with say 1:400 leverage, the likelihood that the holder of this account will be bust within three months is very high. A switch between fear and greed emotions in the brain chemistry is one of the most perilous enemies of a trader. Trading the market is catering to these emotions and short bursts of dopamine when a trader is winning are driving their desire to trade more. Curiously, some social media users are experiencing precisely the same pattern that lures them into continuing to stick to that phone screen on the train. The levels of leverage which the ESMA is mandating are automatically slamming the breaks on excitement levels. Suddenly a trader has to deposit $5000 to open a position sizeable enough to change one’s life. When previously $500 were enough, this makes a huge difference. Brokers will need to change their acquisition and retention strategy altogether to stay on top of their game when attracting clients. After we established some of the potential risks for market makers, let’s focus on STP brokers. Straight-Through Processing (STP) is a different mode of operation for the retail brokerage industry. Such firms are not relying in any way on the losses of their clients, as the money in those accounts is flowing into the market. The revenue of the brokerage is relying on commissions. The more trades a trader makes within their lifespan, the more commissions the brokerage is getting. As a result, we can deduce that such brokerages are keen on their clients not losing money, because they will stop generating commissions to the brokerage the moment they lose their balance. The first one is trading volumes. Granted, broker trading volumes will register a decline, and probably, at least initially it will be big. Leverage restrictions, however, have had a mixed impact on other markets. In Japan, for example, the official maximum leverage of 1:25 has not impacted the industry in the long run as local brokers are posting the highest trading volumes in the world. Capital requirements is another issue. All brokers are now mandated to provide negative balance protection and the FCA was one of the first regulators that suddenly realized that having firms with a capital requirement of a couple of hundred grand was no longer adequate. All STP firms are very likely to need to apply for a 730.000 euro ($900.000) license and prepare to meet the capital requirements that come with that. Last but not least, I want to pay some explicit attention to a subject that has not been discussed enough. That is the disclaimer that every broker has to accompany their advertisement messages with a line reading ’90 percent of our clients lose money!,’ or something of the likes. The ESMA’s announcement has just created a great new incentive for brokerages and that is to attract the best possible traders. This will inevitably result in a paradigm shift for good practice in the industry. Suddenly attracting traders is not enough, brokers that want to remain in this industry for the long haul will have to attract the right kind of clients and strive to make their clients better traders all the time. Not many brokers have been working in this direction, and even fewer have been successful in doing so. Education will no longer be an extension of retention. I am referring to a number of products that are branded as education but the only thing they do is confuse a trader even more and completely disconnect them from the reality of the market: it is very hard to make money trading. I hope that many brokers manage to succeed in the quest to teach traders how to trade. It has been a long and hard way for the few that remain in this business. In the meantime, those phony educators that are acting akin to affiliates are now becoming something closer to a bad practice for every broker who is committed to having a good ratio of profitable traders. As the final rules are published by the ESMA and as local regulators start chipping in with circulars, we will know more details. But for now, it is well worth thinking about how you are going to approach this brand new market starting from a couple of months from now. Perhaps the best-known company in all of cryptocurrency has announced their first major acquisition. Coinbase has bought Earn.com, a startup that allows users to be compensated in digital currency for completing small tasks and responding to emails. Recode reports that Coinbase has bought Earn.com for just over $100 million. Along with the acquisition, there are some additional perks for digital currency exchange too. The buyout will enable Coinbase to bring Balaji Srinivasan on board as their first Chief Technology Officer. According to a blog post by Coinbase CEO Brian Armstrong, Srinivasan is “one of the most respected technologists in the crypto field”. A brief look at his resume gives clear indication as to why Coinbase would want him to fill the role of CTO. Srinivasan holds qualifications up to PhD level in Electrical Engineering, as well as an MS in Chemical Engineering. These were awarded by Stanford University where he also teaches a variety of subjects. These include data mining, statistics, genomics, and blockchain courses. Earn.com, formerly 21.co, started out in 2013 as a Bitcoin mining hardware manufacturer. They’ve since rebranded in late 2017. The company now offers a service in which users are paid for responding to emails and completing small tasks such as surveys. By using cryptocurrency to compensate their users, Earn.com can appeal to a truly global user base. They can pay people a small sum of money for their time, even if the user doesn’t have access to traditional banking infrastructure. Investing.com - The dollar remained slightly lower against the other major currencies on Monday after Friday’s U.S. jobs report tempered expectations for a faster rate of rate hikes by the Federal Reserve this year. The U.S. dollar index, which measures the greenback’s strength against a basket of six major currencies, was at 89.94 by 10:13 AM ET (14:13 GMT), down 0.13% for the day. The U.S. economy added 313,000 jobs in February, the Labor Department reported Friday, but average hourly earnings rose by just 0.1%. The strong jobs growth boosted risk appetite, while the slowdown in wage growth dampened expectations for four rate hikes by the Fed this year, a negative for the dollar, which tends to become more attractive to yield-seeking investors when borrowing costs rise. The euro was little changed, with EUR/USD last at 1.2310 after rising as high as 1.2341 earlier. Sterling pushed higher against the softer greenback, with USD/GBP climbing 0.27% to 1.3889. The pound’s gains were held in check amid fears that an upcoming Brexit summit meeting later this month would fail to secure a transition arrangement. Sterling was higher against the euro, with EUR/GBP down 0.2% to 0.8863. Against the yen, the dollar was lower, with USD/JPY down 0.24% to 106.54. Demand for the Japanese currency was boosted amid concerns over a cronyism scandal linked to the country’s prime minister and his wife involving the sale of public land. The safe haven yen tends to rise in times of market uncertainty.